Silent Movie slot machine from IGT is a game that takes us back to what many a grand-parent would call the ‘golden age of cinema’ and the home of the silent movie. Featuring four great movies from the era the mobile slot looks very authentic with it’s black and white theme. It has a RTP of 96.51%, a jackpot of 1,000x, and four great bonus features including a massive free spins round. Check out the Silent Movie slot review below for all the details of this surprisingly good game to play. Celebrate several classic characters from the silver screen in IGT’s Silent Movie slot, a five-reel, 30-payline video slot that celebrates the age of cinema before people even knew what a gritty modern reboot was. As you’d imagine from a slot game based in this era, the reels and icons in Silent Movie are almost completely black and white, with only the wild symbol – a 1920s-style cinema – and the bonus icons – a range of movie posters – bringing things to life in technicolour. Thankfully, there are no playing card values to be found here, with all lower value icons featuring famous actors and items of film paraphernalia. Playable from as little as £0.30 per spin, the Silent Movie slot machine can be enjoyed across all desktop, mobile and tablet devices and features a base game jackpot of 1,000x players’ bet per line amount. The star attractions are the slot’s numerous free spin games, with each one including a rewarding modifier. In order to trigger any of the game’s free spins features, players will have to land cinema admission ticket scatter symbols on reels one and three followed by one of the four movie posters on the fifth reel. These posters include scenes inspired by the silent movie classics Dr Jekyll and Mr Hyde, A Trip To The Moon, A Muddy Romance and Keystone Cops – and each comes with a different set of rewards. Dealing with the games in order, the Dr Jekyll and Mr Hyde feature awards 3-6 guaranteed-win spins during which the value of all payouts are tripled. A Trip To The Moon gives players a greater number of 10-15 free spins with extra wilds being added to the reels. A Muddy Romance, meanwhile, provides 6-12 free spins with additional scatters and Keystone Cops offers 10 free spins with a 2-5x multiplier. While the last game on that list would appear to be the best value, the multiplier only actually kicks in after five spins, so – for our money anyway – the Dr Jekyll and Mr Hyde feature is the best one to land. 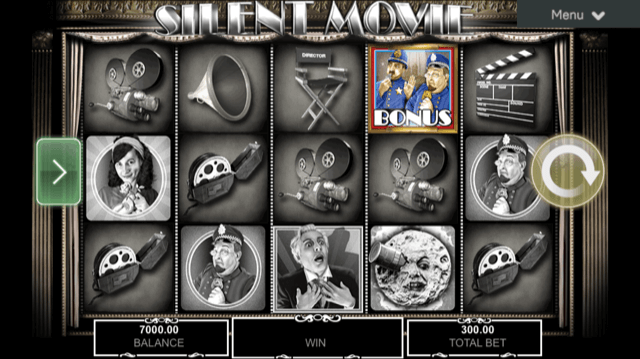 The Silent Movie slot is an engaging game that combines an original idea with some great bonus features. Don’t be put off by the game’s black and white theme – there’s actually plenty of colour to be found here. Like the our review of the Silent Movie slot machine? Check out these as well…..